LaunchBar is a great ‘mouse-free’ utility for instantly getting to files, folders, URLs, music, addresses, and just about anything else on your Mac. 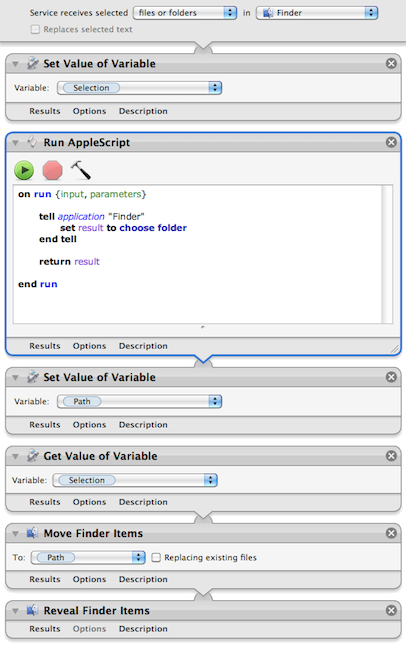 Hit command-spacebar and start typing the first few letters of whatever you want – LaunchBar lists the choices that match and you just hit the return key to open or go to that item. I use it all the time and recommend it to everyone I know. There’s a really handy way of including your recent and favorite folders from Default Folder X in LaunchBar’s index. 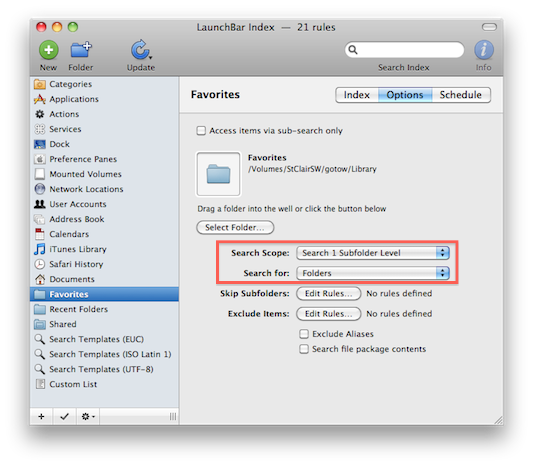 After doing this, you can instantly access those folders from the keyboard using LaunchBar. In your Default Folder X preferences, click on the Advanced tab and turn on “Create aliases of Recent Folders and Favorites in your Library folder”. 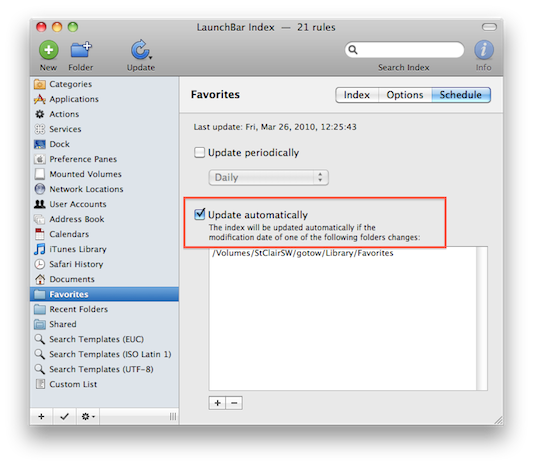 In LaunchBar, choose Show Index from the Index menu. Click on the “Folder+” button in the toolbar to add a folder. Once the folder is added, click on the Options tab for that folder and set Search Scope to “Search 1 Subfolder Level” and Search for “Folders”. Click on the Schedule tab and turn on the “Update automatically” checkbox. 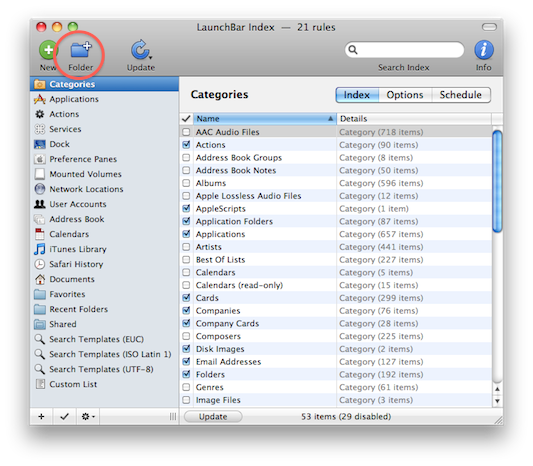 Once you tell LaunchBar to reindex, you’ll have access to all of your Default Folder X favorite and recent folders. It’s been a bit of a fight to get this release finished, but Default Folder X 4.3.2 is finally available! It fixes problems that have been reported when running with Snow Leopard (some my fault, some Snow Leopard’s fault). If you’re a Default Folder X user, download a copy and install it. The update is free and will make everything work more smoothly, especially if you’re dealing with file servers or use column view a lot. Oh, and this version also watches the Recent Items list in your Apple Menu and remembers the folders for documents that OS X adds there. This makes sure that Default Folder X’s list of recent folders is never missing anything. Full details and download links for the English, French, German and Danish installers are available now on the “What’s New” page for Default Folder X. Default Folder X 4.3 Is Available! 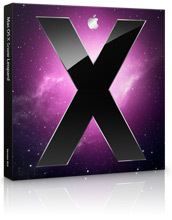 Default Folder X 4.3 sports Snow Leopard compatibility and a number of other enhancements and fixes. You can get it from the Default Folder X release page. IMPORTANT: There’s a bug in older versions of Default Folder X that can cause crashes while you’re using the hierarchical path menu if you’re running Mac OS 10.6. 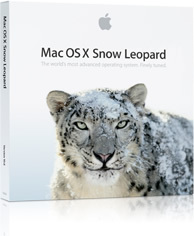 Make sure to install this update before you upgrade to Snow Leopard! Change the numbers at the end of the commands to the sizes you want to use (in pixels). You can list items in hierarchical menus chronologically rather than alphabetically by holding down the Control key. Take a look at the release page for details about all of the changes. Updated the Default Folder X preference pane to run in 64 bit mode. Eliminated “auto malloc” errors in applications that use garbage-collected memory management. Again, because of some of the fixes I’ve made since version 4.2.1, anyone running Snow Leopard should be running a pre-release build of Default Folder X 4.2.2. If you encounter any issues with this build or have suggestions, please don’t hesitate to drop me a line at DefaultFolder (at) stclairsoft.com. Thanks! I’ve put together a development build of Default Folder X that incorporates a couple of important fixes, plus some handy new tweaks. If you’ve noticed a process called DFPreviewServer slowing down your machine or have experienced problems while running Snow Leopard, this build will fix those problems. If you are running Default Folder X on a seed build of Snow Leopard you should install this update NOW. Default Folder X contains a workaround for a bug in OS X’s hierarchical menu system. The old workaround functioned fine in 10.4 and 10.5, but intermittently causes the hierarchical path menu in Open and Save dialogs to hang or crash in Mac OS 10.6 (Snow Leopard). It’s been rewritten and now works correctly. Fixed a bug in DFPreviewServer that could consume a lot of CPU time and memory. This occurred when previewing very large files (greater than 200 MB) that the system identifies as text files. Change the “1.5” in the line above to the number of seconds you want for the delay. 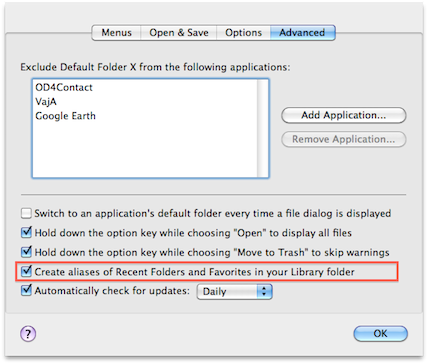 Note that you need to turn Default Folder X off and back on again for this change to take effect. Default Folder X’s “New Folder” command would not work in some applications when creating a folder within a folder that was reached by double-clicking on an alias. This has been fixed. Corrected a problem with the “Make Save dialogs automatically default to the current document’s folder” setting that would cause DFX to default to the top level of your hard disk or your home folder in certain applications (including Address Book).